Chill a cocktail glass. Stir all ingredients with ice cubes and strain into the chilled glass. Garnish with a lemon twist. 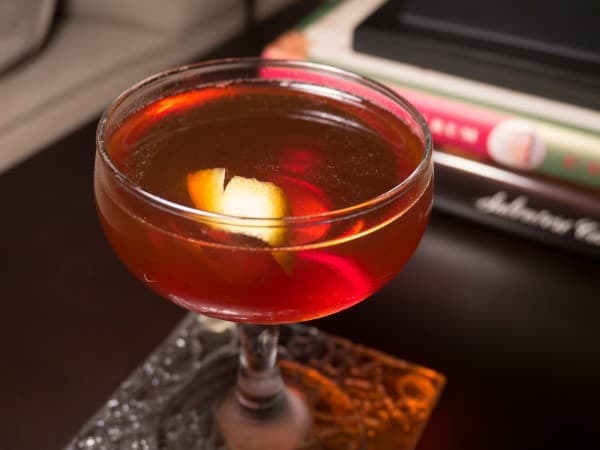 There have been many pieces written on the origin of the Martinez Cocktail and whether it is the ancestor of the Martini. I will not go into the historical information because I believe it has been covered best by David Wondrich in Imbibe! : From Absinthe Cocktail to Whiskey Smash. I would like to talk about how I make my Martinez and some of the choices I have made. First this is a vermouth heavy drink so you need to use a good one. I use Carpano Antica Formula or Punt-e-Mes and have had fantastic results. The former is a little sweeter so it may require an extra dash of bitters to balance it. The ratio between gin and vermouth varies some with a Martinez. It oscillates between 2 to 1 gin to vermouth to 1 to 2. I prefer the version with more vermouth. Old Tom is usually specified in this recipe - it didn't evolve into dry gin like a lot of other recipes (like a Tom Collins). I encourage you to resist evolution in this case. Boker's Bitters is tough to find (the original being defunct now for almost 60 years). I use a homemade Boker's but you can also use Dr. Adam Elmegirab's version which is quite nice (and quite expensive). Failing Boker's you can try one dash each of Angostura and orange bitters. I know a Martinez is technically more of an aperitif rather than an after dinner drink due to the presence of bitters and gin. But the inherent sweetness along with the bitter twang towards the end just seems to help settle a meal for me. The herbs, roots and other botanicals also help. This is one of my favorite cocktails. Let us know what you think of it.